EA has announced that a fully-fledged version of everyone’s favourite life simulation game, The Sims, will be released on iOS and Android mobile devices. However EA hasn’t yet given an exact release date, or how much we can expect to pay when it launches. Nevertheless, it’s certainly whetted our appetite, and we can’t wait to recreate some of our favourite moments of the original game, which launched 17 years ago. EA hasn’t given away everything we can expect from the game, or at least, we hope the features listed so far aren’t the whole package. So we’ve listed a few things we’d like to see make a comeback in The Sims Mobile. Heirlooms is a new feature that unlocks hobbies and careers for future generations, provided your current Sims accomplish their career goals and retire. You can register your interest and notified when the game is available to buy from EA’s website. Be honest, at some point in your Sims’ life, you killed them. Whether you sent them swimming and deleted the steps leaving them to drown, or locked them in a burning building, killing your Sims was a sadistic, yet pleasurable thing. Upon your Sims’ unfortunate death, the Grim Reaper would show up to turn your deceased Sim into an urn or tombstone. Although, because it was The Sims, and therefore could bend the rules of life, you could have other Sims plead with him to bring your ex-Sim back from the dead. If the Grim Reaper obliges, you’d have to have your Sim win a game of rock, paper, scissors. Tying into the death theme, ghosts would be great to see in the mobile version of The Sims. Ghosts would appear on lots with tombstones or urns on them between midnight and daybreak, and you’d hear some specific music to indicate their arrival. You weren’t able to get your living Sims to interact with the ghosts, but the ghosts could spook your Sims. EA expanded ghosts’ abilities in The Sims 2, as different ghosts would appear based on the type of death the Sim suffered. Seeing ghosts even became a want that you could give your Sim. Your Sims were able to have their very own four-legged friend, bird, guinea pig and more in all of the original Sims games. Initially you could only adopt cats or dogs, get some fish, birds and reptiles but in the next couple of games you could get horses, snakes and turtles. Of course, a pet is for life, not just for Christmas, or selecting from the buying mode. You had to look after them just as you would in real life, which means feeding them, training them and playing with them. With pets being such a popular feature among Sims fans, we hope EA includes them in the mobile game. Another thing that we’re sure most Sims players have done at some point is to get a married Sim to have an affair with the neighbour or a family friend. You could take it further and get your Sim to fall in love with someone and marry them, only to run off with the milkman the very next day. Legitimate or accident, children were a popular feature of the original Sims series. You could either create them when making a new family, or have a baby in game, where it would turn into a toddler after 72 game hours. Your children would also be required to go to school and keep up their grades by doing homework. If they missed a day their grade level would go down, which meant more studying to get it back up. If your child’s grade level stayed at an F for too long, they’d be sent away to Military School forever. Expansion packs eventually let your teenagers go off to University, where you could live out their student life, and having this as a feature in the mobile game would be amazing. Children will feature in the game, as you can see them in the trailer, but just how much you can do with them remains to be seen. Ok, so we shouldn’t condone cheating at all, but lets be honest, the Motherlode cheat made everything better. You could live your your Sims’ lives as if they’re real, making them go to work day in, day out to earn a small wage, become too tired and then not have enough time to shower or eat. Or could you gift your Sims several hundred thousand Simoleons (the in-game currency) and let them live out their wildest dreams. We’re not sure how cheats would be enabled in a mobile version of the game, but if there are ways of taking shortcuts to reach the top, we’re interested. Different manufacturers, including Acer and HP, are making their own Mixed Reality headsets that run Microsoft’s software. But to standardise input there will be a unifying control system that will work with both. What’s most interesting about Microsoft’s new controllers is that will not require any additional hardware, such as sensors. The headset itself does the tracking, and sensors built into that device will tell the controllers where they are in the virtual space. Microsoft also revealed that its Mixed Reality system does not require room configuration – it should work install-free. Microsoft is finally implementing a feature in OneDrive that could be forgiven for thinking existed already. OneDrive Files On-Demand will store all of your data in the cloud and only download it when you actually want to use relevant files. At present, your OneDrive cloud storage syncs files across your devices, meaning it stores a copy of each file or entire folder on every device you use to access them – clogging up storage space on your hardware. You can choose which files and folders to sync and which to remain in the cloud, via the settings (or preferences on Mac), but you still have to have entire copies sat on your hard drive of those ticked. While that’s great when you have the space and you want to access your stored content quickly – and offline – it’s a pain when you are a heavy file user. With Files On-Demand you can choose to keep everything in the cloud with OneDrive only downloading the required data when needed. A new status icon will show whether a file is available locally or needs to be downloaded from the cloud first, in case you need to use the service offline. The feature will be part of the Windows 10 Fall Creators Update, coming for developers in September. There will be several other new features too, which will be rolled out to full consumer versions of Windows 10 after. Microsoft is at Build 2017 and has introduced something interesting to consumers: a new Windows 10 app. But it’s not just any app. It’s basically a successor to, or even a replacement for, Windows Movie Maker, an app that let regular people create videos on their Windows XP and Windows 7 machines. Called Story Remix, it works in the cloud and essentially lets you pull in images and video from any device – whether iOS, Android, or Windows. In other words, it provides a true multi-platform experience. You can grab media from multiple devices and get started right away working on your video. We haven’t had a chance to play with it, but it reminds us a lot of Apple’s new Clips app. You can start making an video with Story Remix on an iPhone, but if you want to finish creating it on a Windows 10 PC, you can do that too. The app even supports 3D models and lets you pin objects in scenes. Story Remix therefore combines Microsoft’s Remix 3D and Paint 3D technologies but also seems to borrow a little from Snapchat’s augmented reality effects. And like all video makers meant for the average consumer, you can add soundtracks, including ones from Microsoft’s Groove music service. From what we can tell, this app is aimed at everyday people and not professional video editors. So, with Story Remix, you can quickly create videos, add music and some effects, and work on the project from any device. It will launch with the Windows 10 Fall Creators update, which we expect to launch around September. Check out the video above to see it in action. We’re on the ground in Seattle and waiting for Microsoft’s second Build 2017 keynote to kick off. It’s a return to home turf for the company (or at least, very close to its Redmond headquarters), after hosting its developer keynote in San Francisco for the past few years. We got a solid overview of the company’s broader vision at yesterday’s keynote, which includes a deeper push into AI and intelligent cloud computing. But today, we’re looking forward to presentations from Microsoft’s Windows and devices head, Terry Myerson, as well as Alex Kipman, the brains behind HoloLens. We’ll likely hear about upcoming Windows 10 features, more about its plans for Windows 10 S notebooks and more about its VR/AR pursuit. The keynote kicks off today at 8:30AM PT/ 11:30AM ET. Grab some coffee and strap in for our live blog right here. Click here to catch up on the latest news from Microsoft’s Build 2017. Now that the Windows 10 Creators Update is rolling out to PCs across the world, Microsoft is ready to start talking about its next big OS upgrade. Don’t expect any catchy new names though: It’s called the Fall Creators Update. Microsoft says it stuck with that moniker because it sees this upgrade as a continuation of the themes it developed with the first Creators Update. That’s to say, the company is still focused on helping consumers be creative. Details are still light, but the company revealed at its Build developer conference today that the upgrade will show off how Windows ties into the Microsoft Graph, the underlying set of APIs connecting all of its products. That includes the ability to pick up where you left off working on a Windows, iOS or Android device; a universal clipboard that you can access across multiple devices; and Timeline, a feature that will let you jump back in time to a previous work session using, you guessed it, a visual timeline. While we’ve seen similar solutions, like Apple’s handoff feature between Macs and iOS devices, Microsoft’s attempt sounds useful for consumers who work across Windows and other platforms. Additionally, the Fall Creators Update will be the official debut of Microsoft’s Fluent Design System (previously known as Project Neon). It’s a new interface paradigm for building apps that can work across a variety of devices and input types. While Microsoft is stressing that Fluent Design won’t be a huge visual upgrade from the current version of Windows 10, leaks suggest that it could add some new flourishes. We’re still waiting on more information about how, exactly, Fluent Design will change things for developers, but it sounds like a smart shift for Microsoft, as it expects Windows 10 to reach new types of hardware. In related news, Microsoft revealed that Autodesk and SAP will be bringing apps to the Windows Store later this year. They’re not meant for everyday consumers, but their addition could be useful for 3D designers and enterprise users. It’s tough to say much about them at this point, but having more-notable companies join the Windows Store could convince other developers to port their apps as well. Microsoft doesn’t have a specific release date in mind for the Fall Creators Update yet, but we’ll give you a guess as to the general time frame you can expect it. Click here to catch up on the latest news from Microsoft Build 2017. Fluent Design will let developers create apps that work across “a wide range of device and input diversity.” This means programmers can detect what types of input are available, such as touchscreens, mice, keyboards, microphones and cameras and integrate them into the app’s functions. The system also lets developers tailor apps for devices with large screens or no screens. The Fluent Design System is based on five key elements: Light, Depth, Motion, Material and Scale. Through those principles, Microsoft is exploring the potential for input methods that go beyond a mouse, keyboard, touchscreen or pen. We’re talking about things like using your voice or your gaze to interact with apps, especially in mixed reality scenarios. When all of these elements combine, the end result will be software and experiences that extend far beyond your computer screen, as Microsoft explains it. Windows Ink will also see a big upgrade with Fluent Design. Microsoft seemingly wants you to be able to navigate all of Windows with just a stylus. In the demos on stage today, examples like striking through a word to delete it in a Bing search box or using the Surface Pen to scroll a page show the potential for Ink in upcoming apps and Windows 10 as a whole. One of the most obvious benefits of Fluent Design is its potential to make existing apps compatible with new platforms and devices like HoloLens, or one of the many Windows mixed reality headsets we’re expecting later this year. Cosmetic changes to the way Windows 10 currently looks are minimal, and the update will happen in stages over time instead of all at once. Microsoft says the rollout will be delivered to its Insider program users first, and will arrive with the Fall Creators Update. Microsoft’s push into being the connective glue between all your devices is encompassed in Graph. That is what the company is calling a handful of features it says will “connect dots between people, conversations, projects and content.” Announced during the second day of Build 2017, the aim is to make all things Microsoft work seamlessly, whether you’re on an iPhone, an Android device or a Windows PC. (And without mentioning Continuum.) It goes beyond that, tapping into Microsoft’s cloud storage services in a bid to make you more efficient switching across different hardware, and keeping track of (almost) everything you do on your PC. Let’s take a look. Timeline is possibly the most intriguing feature, offering a (literal) timeline of what you were working on / doing on your PC months or even years ago. This will encompass files, apps and even websites: Microsoft says it’ll be as if you never left them. Will it offer older unedited files? Will this visual timeline only begin from the day you start using the latest version of Windows? We expect to hear more from Microsoft on this. Cortana is, predictably, a prime part of that whole seamless digital experience. Microsoft explains you’ll soon be able to log off your PC, and have the document you were previously poring over pop up on your smartphone — who needs a coffee break, right? Cortana will ask if you want to pick up where you left off, whether it’s a document, website or app. It brings the promises of Continuum to phones that aren’t running mobile iterations of Windows. This is a good thing. Clipboard is also picking up a cloud-powered upgrade, with the option to copy from and paste to any of your connected devices. At the moment, they have to be Windows machines or popular smartphones, and we know that for mobile devices, you’ll need to have Swiftkey installed as a keyboard to offer up the pasting shortcuts. It’ll be able to beam photos, links, entire paragraphs and even GIFs (less important) across your various devices. The final part of the Graph pitch is Microsoft’s cloud storage service, OneDrive. Now with “Files on Demand”, users will be able to access and use all their cloud files without having them take up precious storage space on whatever device you’re using. They’ll be displayed in File Explorer, and you’ll still be able to lock them to work offline when you need to work without an internet connection. All these features will roll out with the Fall Creators Update later this year. Naturally, too, they will also arrive decked in the company’s new Fluent Design, ready for mixed-reality headsets in 2020. For the Fall Creators Update, Microsoft has unveiled a new app that can transform your photos and videos into a cinematic spectacle, complete with CG effects, titles and a soundtrack. Called Story Remix, it’s a Universal Windows App that uses deep learning and Microsoft’s Graph, letting you pull media in from colleagues and friends. It’s a powerful yet simple app that uses image analysis and AI to do clip discovery, effects integration and the entire edit, complete with music. It’s like a fancier, smarter version of Apple Clips, Google’s Photo Assistant or the Magisto app (remember that? ), but geared toward Windows 10 content. As a nod to the latest Creators Update, it can also pull in 3D objects from Paint 3D and other programs or let you draw on your videos and photos using Window Ink. The interface features an asset pane on the right; “explore,” “create” and “folders” tabs up top; and a playback window below — like a simplified version of Final Cut Pro X or Adobe Premiere. However, rather than using frames, video clips and photos are shown as thumbnails with the length in seconds and frames superimposed. From there, you just drag clips around to reorder them or grab the head and tail to change the length. Various tools let you add text, filters, soundtracks and more. Microsoft Graph comes into play by letting you pull in content from friends or colleagues, contribute clips or marry your own videos with others. Thanks to the deep learning, it can remember your preferences and prebuild videos that are creatively in tune with your past projects. While relatively simple, Story Remix goes beyond other editing systems in many ways. Thanks to machine learning, it can analyze your photos and videos, then figure out when and where your media was shot and who’s in it, and it can even pick out the ground plane and other objects. That makes it much easier to find specific shots containing dogs, trains or people, saving you a whole bunch of searching and scrolling through clips. From there, it can automatically edit media, add a soundtrack, lay in transitions and give you a final cut with hardly any effort on your part. If you don’t like it the first time, you simply hit the “remix” button and it will completely change the style and tone of your piece. You can add titles from Microsoft’s Pen and Ink or insert 3D models, explosions and other mixed-reality content from Microsoft’s recently launched 3D Remix asset site. Thanks to its AI, Story Remix can do advanced 3D motion tracking and figure out the 3D perspective and camera position of a photo or video. In one example (image at top), a boy with a magic wand shot on an iPhone conjures up a CG dragon from 3D Remix, with lightning bolts from the boy’s wand (again from 3D Remix) used to complete the effect. All the user has to do is drop in the model and everything will automatically line up in perspective. Story Remix is a pretty canny app: It takes the drudgery out of editing, helping inexperienced users create full videos. At the same time, it enables some pretty advanced effects, again without a lot of complex knowledge required. That makes it ideal as an educational tool, letting kids collaborate to build fun videos while learning the art of cinema. The full Story Remix app, with automatic editing, 3D Remix support and more, will arrive in September with the final release of the Fall Creators Update. However, a basic version called Photos will arrive on Thursday with the first Windows Insider build. 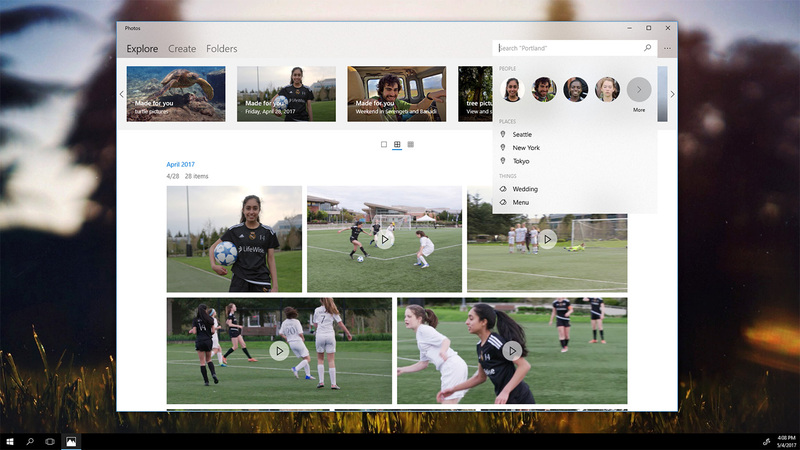 This fall, all of your Windows files will be viewable and accessible from File Explorer regardless of whether they’re stored in OneDrive or locally. 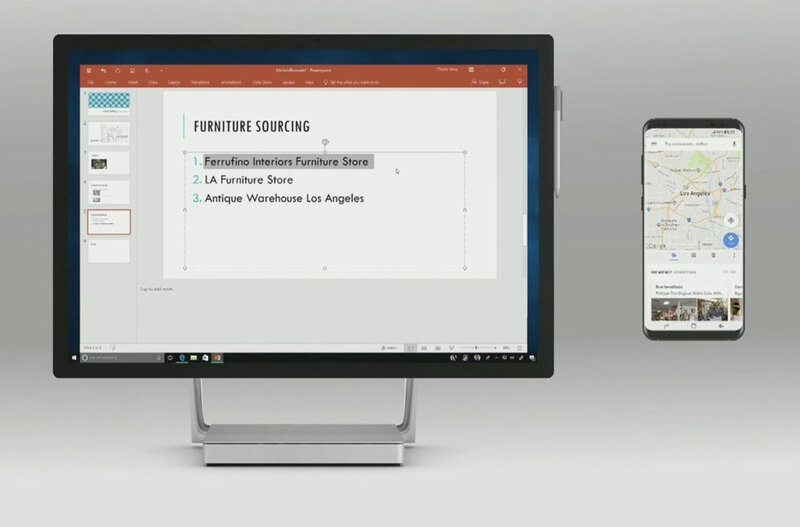 It’s something Joe Belfiore talked about onstage from the Build keynote, explicitly saying that all the fancy tools we’ve seen so far this morning for collaboration will benefit from it. “With Files On-Demand, you can access all your files in the cloud without having to download them and use storage space on your device,” a blog post reads. Microsoft says that this has been the No. 1 user request. Think of it like a cloud-based folder on your device that syncs basically everything across users and across all of their gadgets.